A quick note to let you all know we are currently negotiating with a Seattle-based post production facility to fulfill our grant from Women In Film, which will enable us to lock the picture. We have submitted to several fall film festivals and will update you when we have news. We’ll be announcing a Seattle area screening in the next week or two, which will probably occur in late May. Stay tuned! Cartel Land, Welcome to Leith, Meru, The Wolfpack, Going Clear, Steve Jobs and 3½ Minutes,10 Bullets. These are the last seven documentaries I’ve watched. All seven share some very similar stylistic elements: a sensationalist story; a heightened and insistent music score; a tightly packed, almost breathless three-act narrative structure; and the imprimatur of a big-screen release. I realize “big-screen” is a somewhat outdated term, but these movies are packaged for maximum theatrical impact, intended to envelope you with their soundtrack and forceful dramatics. Most of us, however, will watch many of them, like I did, at home. I can’t imagine myself ever wanting to make a movie like those mentioned above. None have a sense of much personal investment in the subject matter, many come across as over-determined, most feel cluttered, and they are all clearly driven by a need to earn back the money the releasing studio has invested in them. But these are the kinds of documentaries that get a theatrical release nowadays. These are the docs where funders put their money. These are the docs getting into Sundance, SXSW, and the Toronto International Film Festival. If you are a documentary filmmaker today, it’s important to recognize this undeniable trend, which represents a “big change in the last 5 or 10 years” according to a panel of so-called decision makers I attended as part of September’s IFP Conference: Screen Forward in New York. Another panel, which offered a breakdown of the successful marketing campaign for The Wolfpack, echoed similar themes. Your film must have “incredible access, incredible characters and be beautifully rendered.” Cogan said that Impact Partners is interested in “great films that also happen to be social issue documentaries,” and he added that audiences are “demanding more creative documentaries” and are more “interested in great stories than in issues.” Frankly, that sounds like a contradiction, but if I understood correctly, this is the “big change” in documentaries in the last half-decade. A swerve away from purely agenda-driven social issue docs about food, climate change and toxic chemicals, and towards docs that feel, more often than not, like fictional films. This makes the message to filmmakers loud and clear: don’t even think about knocking on our company door unless your documentary is great, incredible, passionate, impactful and dramatic. Okay. Wow. I get it. Making a successful documentary is like rushing a sorority. You must be exceptional, beautiful and–it goes with the territory–a conformist. Examine the similarities in the films I mentioned earlier. Cartel Land, which is powerfully filmed, offers an up-close view of vigilantism in the Mexican drug wars. But the film’s verité power is eclipsed by a visceral gloss, an editing scheme designed to move us from one action set piece to the next, and a relentless Hollywoodized music score. The same goes for the white supremacist subject matter of Welcome to Leith, which tries to construct a compelling film out of a paucity of compelling elements: a couple of grandstanding neo-Nazis, a few seconds of reality TV-style iPhone footage, and a relentless Hollywoodized music score. Meru, the most egregiously over-packaged documentary of the bunch, turns its extreme how’d-they-do-it climbing footage into what amounts to filler between the phony, digitally manipulated mountain wide shots and aggrandizing climber interviews, all of it propelled by a–you guessed it–relentless Hollywoodized music score. There’s nothing inherently wrong with this. There is no law that says documentaries can’t be entertaining. And it’s certainly nice to make some big money for a change. I also agree that it’s time the strictly issue-oriented doc put story-telling and cinematic artistry ahead of polemics. But the studios’ self-righteous claims about impact are kind of ridiculous. Of the films mentioned in the first line of this post, only one, 3½ Minutes, 10 Bullets, about a headline-grabbing racist shooting and the subsequent trial, offers any insight or subtlety, although it too suffers from the same relentless music score (can we please have a moratorium on the ominous soundtrack drone?). What concerns me more in this new era of the big screen, high drama, sensationalist documentary, is the simultaneous devaluation of all the other types of documentaries being made. The kinds of films the majority of filmmakers actually end up making. The ones that play like personal histories, short stories, ethnographic studies, or observational portraits of cultures or places. These are the films deposited into the digital vaults of iTunes, Amazon, Hulu, GooglePlay, Vimeo, IndieFlix and the countless other tributaries of the online streaming universe. These are the films that feel to me infinitely more unique, more creatively daring and more deserving of our love, attention and care. But be warned: these films, the film you are making or self-distributing right now, will never make back the Kickstarter dollars you raised to finance it. The gulf between the haves (the Cartel Lands and the Merus) and the have-nots (your movie) is as vast as the gap between the 1% and the 99%. Okay. I get that, too. And I’m fine with it. Really. Because it is liberating to know the odds before you embark on the making of, and the ultimate distribution of, your labor of love. Yes, my wife and filmmaking partner Ann Hedreen and I want people to see our current film, Zona Intangible. We don’t want to just make it for our 211 Kickstarter backers. We love the story we’re telling, the characters we’ve introduced, the spirit that our film embodies. But we’re not deluding ourselves either. Our film is not a change-the-world movie. It doesn’t contain dark revelations, sensational dramatic conflict, or last-minute twists (although there are a few low-key final act surprises), but does that mean it’s not worth making and not worth seeing? If I was giving myself advice (and you can take it or leave it) I’d say this: ignore the trends, adjust your budget accordingly, shrug off the rejections, manage your expectations and make your movie. We are halfway through our Kickstarter campaign for Zona Intangible. Please check it out! Thanks. Pitching your documentary to a prospective funder, programmer or distributor used to be something you only did in elevators or noisy bars while clutching a watery gin and tonic. Now, it’s become a formalized, high-pressure event in and of itself. Pitch forums at Hot Docs, IDFA, Camden, Tribeca, and AmDocs exist for filmmakers who must first compete to be selected to pitch and then, if they aren’t rejected right away, will actually pitch their project to an assembled panel of “decision makers” who–more than likely–will still reject them. Don’t we already face enough obstacles and deal with enough rejection on the road to finding a home for our movies? Do we now have to be told that even our “pitch” is unworthy? What’s more, we have to find the time and money within our strapped production budgets to submit to and then attend these forums. Give us a break; we haven’t even finished our movies! These were the thoughts clattering around my skull as I attended an event called DocForest, hosted by the Seattle Documentary Association in a rustic Northwest forest setting, where doc filmmakers come together to share their projects, offer encouragement, support and constructive criticism, and eat, drink, and consume other legal (in Washington state) substances. DocForest is intended to be a safe place for filmmakers, and I wasn’t there as a reporter, so I won’t identify any of the people I refer to in this post. Sometimes events like these end up being a mutual admiration free-for-all, with an unspoken “let’s keep it positive” vibe coursing through the various presentations and workshops. There was definitely some of that going on, but what I found refreshing was a healthy, honest skepticism about the present and future of documentary filmmaking. People voiced their frustrations, incredulity, and critical opinions with a righteous energy, and I soon discovered that many shared my suspicions about film festival fixes, funding favoritism, and, especially, the “Pitch” as simply one more way we can add yet another notch in our belt of failure. The panel invited to share their pitching experiences and to facilitate a very casual pitch forum included filmmakers who crafted successful pitches in the past, a film festival programmer, and a distributor-producer who produced an Oscar-nominated doc a few years back. He started things off with a bracing declaration that documentary filmmakers “are losing power in an industry that is going nowhere.” It was the truest thing I heard all day. But there was more to come. Despite the pitching war stories and the several cold showers of reality, the workshop was actually quite helpful. It may have convinced many of us to never apply for one of these things, but it taught us to understand what is important to include in even the most spontaneous of pitches, how to be brief and clear, what to tell and what to show, when to listen and when to shut-up; even if all you really want is 3 minutes alone in an elevator with the director of the Sundance Documentary Fund. And our panelists–a very relatable bunch–said that even the pitch sessions you find at the smaller festivals could result in real dollars and real interest in your film. A few tips if you’re making a formal pitch (not in this particular order): make sure the people on the panel have a history of greenlighting subject matter like yours; talk about your goals (money, distribution, pre-buys); tell what the film is about in one or two effective sentences first, then provide more detail or scene-setting (but don’t repeat in your verbal pitch what you show in your trailer); describe the what, when, how and the why of your film (as in “why” anyone should care); don’t be combative if someone clearly doesn’t like your film; follow-up later with more explanations if the panelists have questions or reservations; always include visual, oral, and written elements to your pitch; and realize that your trailer or teaser is 10 times more effective than anything you can say or write. As for me, I didn’t bother trying out a pitch for our film, Zona Intangible. We haven’t come up with a succinct description of the movie yet, and I didn’t have a short enough clip on hand. But I did have a trailer to show for another film I’m working on, and I already had a semi-pitch statement culled from a grant I applied for. So I gave it a go. It was nerve-wracking, even in the safe and friendly environment of DocForest, but what happened was surprisingly gratifying. People responded positively to my obviously unrehearsed pitch, and their emotional reaction to the minimalist mood of my trailer was extremely encouraging. Throughout the rest of the day, I received a lot of supportive feedback and useful critiques. Quite unexpectedly, a film that had been secreted away in my editing bins was suddenly made a reality. There seem to be so many music documentaries these days. The Wrecking Crew, Twenty Feet From Stardom, Muscle Shoals, Montage of Heck, What Happened, Miss Simone? But despite the range of subject matter–from backroom jams to grunge rock to soulful vocals–these films all adhere to the same unwavering approach in style and structure: a parade of talking heads interrupted by brief music clips that segue into a slapdash montage followed by another parade of talking heads. Rinse and repeat. I’ve noticed a similar trend with the historical documentary, the celebrity doc and the bio-pic, and I often wonder if this stylistic repetition among high profile (re: mainstream distribution) documentaries is due to myopic funders, bottom-line focused distributors, cautious film festival programmers or unimaginative filmmakers. Or parts of all of these elements put together. I think of these things while editing our documentary, Zona Intangible. I battle the voices in my head, the voices of the marketplace, as I struggle to make aesthetic choices that turn unexpected corners, that travel briefly down visually exotic alleys, that lead us into layers of story and image, while purposely steering clear of the signposts of the three-act structure, dramatic conflict, and the penultimate climax. I’m working with the usual materials that make up a documentary film: two or three central characters, unique access to them and their surroundings, interviews and b-roll, photographs and archival film, music and narration. But what I’m attempting to do as I cut, snip and splice, is to find a fresh way to introduce and express these tried-and-true building blocks. I’m trying to avoid displaying our characters in typical talking head fashion, not only covering their statements with b-roll but using them on-camera in the form of silent portraits. With our b-roll, I’m experimenting with letting a single shot run for 10, 20, 30 seconds (or even longer), inviting the viewer to immerse themselves in the scene, challenging them to patiently await the next edit. 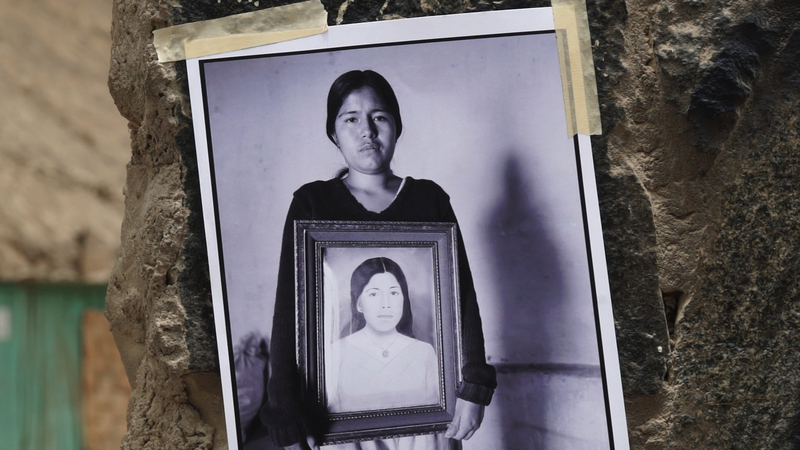 Our photographs, a combination of personal snapshots and photojournalism (shot by photographers during the time of Peru’s Shining Path, or Sendero Luminoso) are not presented flatly, filling the screen from edge to edge, but shot in context, taped to the walls of shacks, lying face up in the rocks and dust, or snagged in barbed wire. The archival film we’re working with, of Peruvian fishermen hauling in anchovy from the Humboldt Current, will appear first on the screen of a ‘70s model portable TV, plunked down on the shore of the Pacific with a blazing sunset behind it. Our soundtrack will not be a tasteful and expensively composed menu of music tracks, but a series of public domain-era Andean folk music songs, raw, beautiful, and handmade. And our narration (the sacrificial lamb of documentary narrative, too often eschewed in favor of onscreen text) is written in the form of a personal essay, delivered by writer and co-director Ann Hedreen, a weave of the ruminative and the reportorial. We are also trying to tame the voices that require a film to be presented in a classic, easy-to-follow structural arc. Too many documentaries, like far too many feature films, come to us already pre-packaged, resembling a movie trailer that gives away the whole plot. I’m not sure why documentary filmmakers spend their precious time making a film that feels and looks like other films. The advocacy doc, still in vogue after all these years, is particularly egregious in this regard (Ann Hornaday echoed some of these thoughts in an article for the Washington Post). To counter this tendency, I admit that I sometimes go too far in the other direction, putting style ahead of content (this is when Ann must coax me out of my own myopic, hermetic pretentions). But narrative and artistic risk is, for me, the juice. If I’m going to stare at my FCP timeline for hours, days and weeks, I need it to surprise me, entrance me, challenge me. That’s why we’ve chosen to tell our story in the form of a dense, layered, slightly askew non-fiction novella, a story spanning time, history, personal memory, and the global future. There is of course an arc to the story, but the arc is more of a series of jagged Andean peaks, rather than the rounded curve of a perfectly presentable hill. I can’t say Zona Intangible will bust all of the documentary film conventions, nor will our unconventional tactics be all that radically daring. And we know that our choices may make the film less palatable to distributors and festivals. But I’d rather push out to the edges of the aesthetic envelope rather than churn out a film that will look and feel like too many other films. The quote at the beginning of this post was written by one of America’s orneriest, opinionated iconoclasts, who liked nothing more than to sit in the desert for hours gazing at the fire he built from juniper branches, inhaling its fragrant smoke, and watching the embers glow. Our film may not end up being radical or daring or even all that innovative, but it will be, first and forever, our fire. Into the Zone: Telling a story. I recently taught a class at Seattle’s Northwest Film Forum called “Lean Team Documentary Filmmaking.” The idea was to help fairly inexperienced filmmakers find the confidence to tackle a documentary by themselves or with one other producing partner. I emphasized keeping your footprint small, your equipment basic, and your subject matter manageable. I wanted them to filter their entire doc filmmaking approach through the Lean Team model. If at any time during the making of your film, I told them, you start putting on weight (toting along that groovy Kino-Flo you don’t need; hiring a grip to set up that cool new camera slider you bought on B&H Photo/Video; shooting so much footage you need a four-person team of transcribing slaves just to wade through it) then you have abandoned the core principles of LTDF (Lean Team Documentary Filmmaking) and it’s time for a reassessment. What kind of film do you want to make? How much money do you want to raise–and spend–to make it? How long do you want to wait before it’s finished? Each pound–literally and figuratively–you add to your film will mean more pressure to pay for it, which means more time you’ll spend looking for help, applying for grants, submitting to pitch sessions, etc. The Lean Team model is intended for the creative person who wants to be a constant filmmaker, not the creative person who may spend ten years of their prime filmmaking years making just one film, and be so burned out at the end of it they’ll never want to make another. In making our film Zona Intangible, as with all of our docs, we applied the LTDF model almost without thinking about it. We were intrigued about a health clinic named after the great uncle of my wife and producing partner, Ann Hedreen, smack in the middle of a dusty human settlement just outside of Lima, Peru. We inventoried our mental LTDF checklist of questions: could we film the story with just two people; could the b-roll and interviews be accomplished with a bare bones equipment package; were the characters and locations accessible; were the shooting conditions safe enough so we didn’t require security, assistants, permits, etc. ; once we started the film, could we complete it in a relatively short time frame, since we didn’t have the time, money, or inclination to make several trips back and forth; would the completed film have audience and distribution potential (admittedly, a difficult question to know the answer to in the early stages). The answers were mostly all “yes,” although we did need to hire a driver and a translator. The key component to all of the above rests on a mantra I’ve repeated to myself since I began shooting TV news in my very first job in Reno, Nevada in 1981: GET CLOSE. If you can get close to your characters, your b-roll and your sound source, you can shoot a documentary all by yourself. You don’t need a soundperson hanging a boom mic over every shot, you can interview people off your on-board shotgun. You don’t need an assistant moving lights or carrying equipment, you’re shooting handheld with available light. You don’t need an external monitor or a director telling you what to do, this is your film and you’re in charge. The intimacy and mobility that comes with LTDF is liberating. If two of your main characters start walking up a steep, sandy path in the barren hillside of a squatter’s community, as a doctor and nurse did in Zona Intangible on their way to making a housecall, you’re already shadowing their every move. You are synced to the story’s own dynamic force. There are many other steps to making a successful lean team documentary. I covered them in my class, including tips on gear, shooting in the field, capturing ambient sound, finding textural elements in a scene that add to the aesthetic subtlety of a moment, and recognizing and using available light. There are also many things you can do in the field to minimize your post-production costs. I won’t go in to them right now (that’s what the class was for), but much of the success of LTDF comes down to a crucial difference in viewing the holy grail of documentary filmmaking: the story. I urge lean teamers to concentrate on finding A story, not THE story. I think too many filmmakers get bogged down in an elusive search for what they perceive to be the only story worth telling, when really any story, imaginatively and artfully told will do just fine. 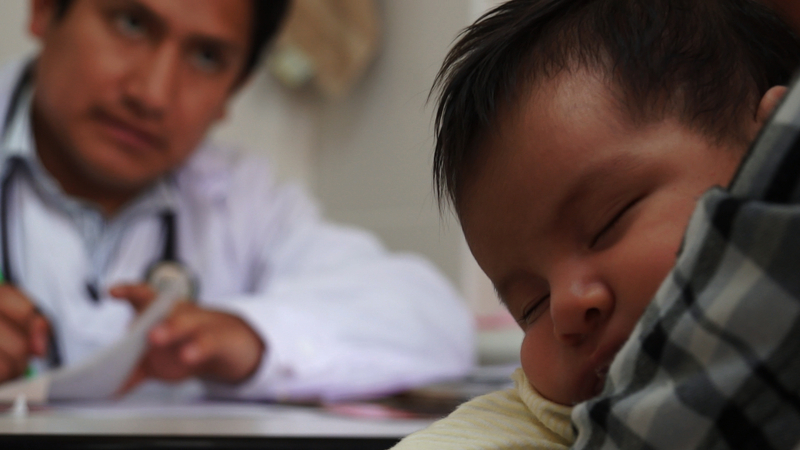 We went to Peru thinking were going to tell THE story of a health clinic in the middle of a desert slum that would represent the global crisis of refugees surrounding the major cities of the developing world. But then we realized that in order to tell this story we’d need a far more wide-ranging film, a more expensive-to-make film, a more time-consuming-to-make film, a much fatter film. So we readjusted our expectations and asked what story we could tell with our lean, two-person team. We decided to tell a much more narrow, personal, idiosyncratic story in the form of a personal essay of observation and reflection, combined with a ruminative investigation of the notion of home. It’s A story we look forward to telling, but it’s hardly THE story. Two recent films come to mind that illuminate, for me, the difference between A and THE. In Oil & Water, directors Francine Strickwerda and Laurel Spellman Smith could have made a film about big oil, the stomping carbon corporate monster in the jungle, and the two Davids struggling to defeat this Goliath. That is The story the filmmakers chose to place in the background. Instead, they told A story, an engaging, moving, personal story, of two boys who come of age during this time, each navigating the struggles of becoming young men and responsible citizens at the same time. In the recent doc The Wolfpack, the director Crystal Moselle sells her film on the basis of The story of six NYC brothers who grow up in virtual imprisonment in their public-housing funded Lower East Side apartment. But the film, although intriguing to watch and think about on its surface, is, in my opinion, an amorphous, underwhelming work. The movie drifts along without a sense of chronology or meaning. Would it have worked better if it had told A story of one brother’s liberation (the first one to leave the apartment), A story of parental abuse, A story of the power of imagination to overcome physical limitations? The lean team documentary filmmaker, the one who wants to be a constant filmmaker, eventually comes to realize it is infinitely more rewarding to tell A story, rather than THE story, simply because you won’t be able to wait until you find another to tell.